Austin Hemmingson | Daily Press Gladstone’s Megan Crow (42) blocks the shot of Escanaba’s Lexi Chaillier Monday at Escanaba. Crow led the Braves with 19 points in a 53-52 win. 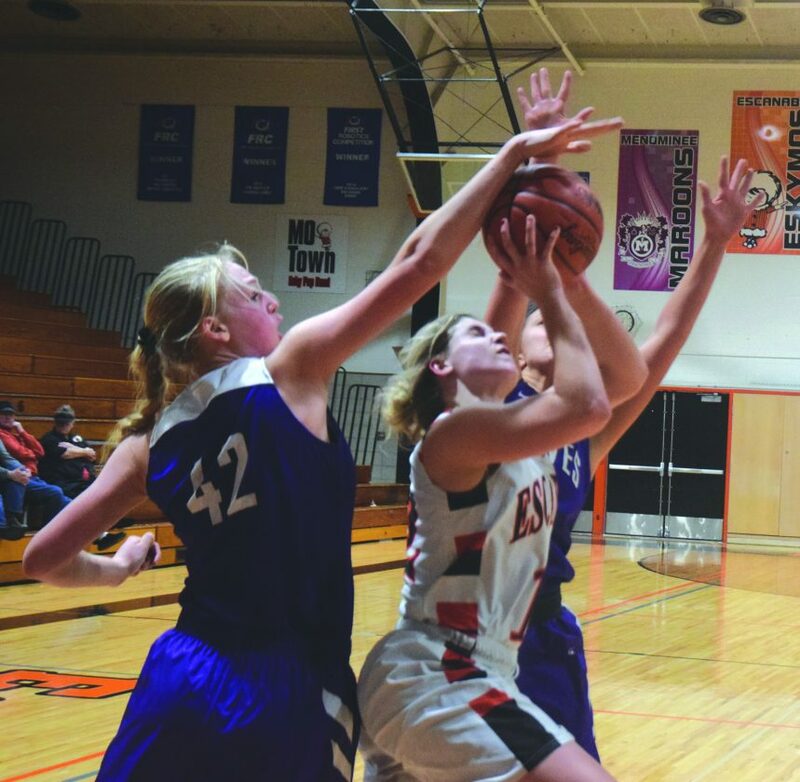 ESCANABA — The Gladstone girls basketball team has come a long ways since starting the season 0-6. Monday night, the Braves took another step in showing that against arch-rival Escanaba. Sophomore Alaina Trudeau hit two three-pointers in the final three minutes, and the Braves held off a late Esky charge to hang on for a 53-52 win here in a Great Northern Conference match-up. Esky’s junior guard Taylor Ray tied the score at 45 on a three-point play with 3:18 left in the game. On the ensuing Braves’ possession, Trudeau tripled from the left wing at the three-minute mark to put the Braves up by three. After another lay-up by Ray, Trudeau tripled again from the top of the key to push the Braves’ lead to 51-47 with 1:24 left. Trailing 51-48 with 42 ticks left, Esky sophomore Nicole Kamin stole a pass at mid court and drove for a layup that cut the deficit to one. Gladstone sophomore Megan Crow got fouled on the next possession and missed the front end of a one-and-one. But sophomore Marnnea LaFave was there for the rebound and the putback to push the Braves’ lead to 53-50. The Eskymos (7-7, 2-4 GNC) responded on the other end with a layup by Kamin to make it 53-52 with just 15 seconds remaining. Esky called a timeout to set up its full court press and the Braves turned it over on the inbounds, setting up one last chance. Kamin grabbed the loose ball and drove to the center of the lane, putting up a floater over Gladstone’s Andie Balenger that fell short with five ticks left. There was a scramble for the rebound and time ran out. There appeared to be some contact on Kamin’s last shot, and Esky coach Mike Beveridge believed a foul should’ve been called. It was the fifth win for the Braves (6-8, 3-4 GNC) in their last six games, and they were able to avenge a 38-33 home loss to Esky Dec. 21. Cretens said his players thrive in the big moments. Despite the loss, the Eskymos got a huge night from Ray, who finished with a career-high 26 points and hit five treys. She also had six rebounds. Esky led 18-11 with 6:50 left in the second quarter after a triple by Kamin, but the Braves finished the half on a 12-4 run to take a 23-22 lead into the break. “We passed and cut well in the first quarter,” Beveridge said. “In the second we got a little stagnant. They got better shots than we did because we kind of got away from our scheme. Crow finished with 19 points for the Braves. Trudeau tied a season-high with 15, while Maddie Ahlgren had 12. Trudeau and Ahlgren both hit four triples. Kamin added 17 points and 12 rebounds for Esky, which won the jayvee game 48-25. Senior guard Lexi Chaillier, the second-leading scorer on the team, finished with just four points but had five assists and eight rebounds. The Braves visit Gwinn Thursday, while Esky visits Ishpeming Thursday. Before the game, Esky honored Abbie Silverstone, a young Eskymo who overcame cancer. The girls basketball team raised over $1,400 and presented it and other gifts to her. Gladstone — Crow 19, Trudeau 15, Ahlgren 12, LaFave 4, Balenger 2, Zeise 1. F: 16; FT: 5-11; Fouled out: None. 3-point field goals: Trudeau 4, Ahlgren 4. Escanaba — Ray 26, Kamin 17, Weber 5, Chaillier 4. F: 14; FT: 11-17; Fouled out: None. 3-point field goals: Ray 5.